In this modern world, your business need speed, perfection and automation. We understand your desire and armed to fulfill at its best! We at SrushtiSoft not only make sure delivering software solutions on time, its about building long lasting relationship and provide better software with high class quality. There is no 'free-size-fit' software which can address all your business requirements. That's why team at SrushtiSoft devoted to craft specialized software for your precise business needs. Modern world already realized that computerization is one of the key aspects for any business to grow faster and in efficient manner. Software programs developed by expert and experienced programmers at SrushtiSoft offers you great solutions and quicker execution. The end result- Profit in your business! As a company we value honesty, openness, excellence and continual self-improvement. We are committed to our customers and partners. 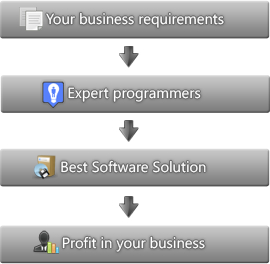 Traditional software development and service companies provide software solutions for the signed deals only. As soon as the software developed by these type of companies hosted on customer's server and running fine, they tend to gracefully close the deal if you have not purchased Annual Maintance Contract (AMC) from them. SrushtiSoft provides its customers free hardware and software consultations! Microsoft Windows Desktop Software Applications which can run on any current and future versions of Windows Operating system. Web site development, hosting and maintenance with high-security measures and using most advanced technology- ASP.Net from Microsoft, get your business running online. Also laverage our end-to-end website solutions right from developing, hosting and maintaining it. Cloud based Desktop and Web Applications is the next big trend, offering easier manageability and less maintenance. Help accessing your applications and share data securly with you everywhere, anytime. jQuery + HTML 5 Android/iPhone based mobile applications for the fast paced mobile world and your ever growing business.